The 37th annual Bologna Motor Show, taking place now in Italy, is the world's most popular sports car and Formula One show where more than 800,000 people will come to see the top examples of speed and prowess available on to the automotive enthusiast today. At this premier event, the new McLaren 12C Spider is being showcased as a best-of-breed from Gruppo Fassina at McLaren Milan, the company's retail location in Italy. The Italian market is the most competitive in the world when it comes to exotic sports cars and powerful Formula track machines. The 12C Spider is unusual in that most of the cars Italians enthuse over are enclosed coupes and racers. The fully-automatic, 2-piece Retractable Hard Top on the 12C Spider is unique. Of course, the Spider is otherwise identical to the 12C, which has won over Italian audiences in the past with its dedication to a powerful driving experience facilitated by the 3.8-liter V8 twin-turbo G25PS and carbon fiber MonoCell. 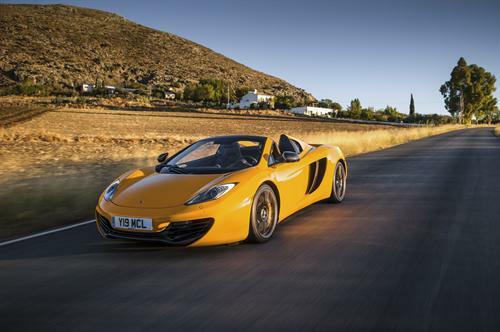 The 2013 McLaren 12C Spider launches from 0-62 in 3.1 seconds (as does the coupe) to a maximum speed of 204 mph. Class-leading fuel efficiency is another interesting point, with the 12C Spider returning 24.2 mpg combined. The Bologna show runs through December 9. If you happen to be in the neighborhood, the McLaren display is located at Pavilion 29 and McLaren rep Amel Boubaaya, the European PR Manager, is on site through to the end of the show. The British sport car maker has so far seen great reception for the Spider from the Italian audience of sports car aficionados.